To the north of B6398 no evidence of the station remains. The platform area and goods yard are now a car park with a small residential development (Old Station Court) occupying the site of the station building and forecourt. To the south of the road a council depot car park occupies the site of the up platform, but the bay platform and overgrown trackbed survive adjacent to the engine shed. 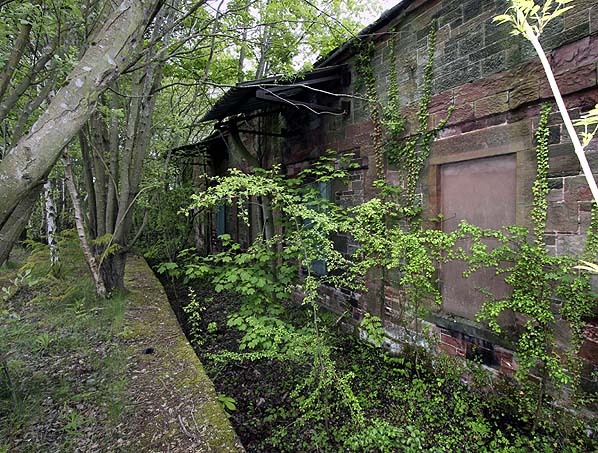 St Boswells is the only surviving small engine shed on the Waverley route. The front entrance was bricked up many years ago but the building is still in good condition, complete with timber roof trusses. For many years the yard was used as an oil storage depot but it is now owned by Cooks van hire. The shed is currently empty but a planning application was submitted in October 2010 to use it for vehicle maintenance. The water tank on a stone tower at one corner of the shed is also extant . Notes: The station was opened on 20 February 1849 as Newtown Junction station. 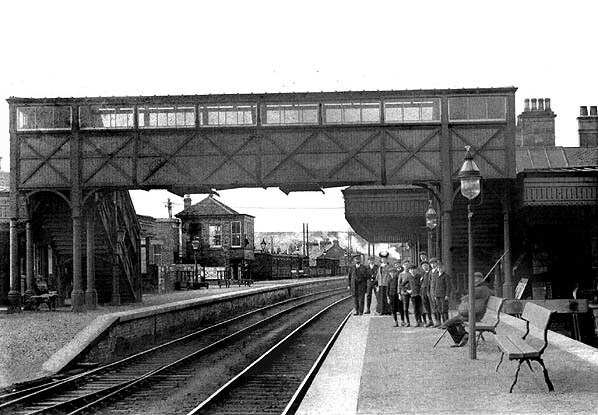 It was one of the major interchange stations on the line and served as the junction station for branch lines to Reston to the north, and Jedburgh and Berwick to the south. Station signs read 'St Boswells change for Kelso, Jedburgh, Earlston, Duns, Berwick - but after closure of the other lines these were replaced with signs showing 'St. Boswells change for Jedburgh & Kelso bus services'. In January 1853 the station was renamed New Town St Boswells and on 1 March 1865 it became St Boswells. The station was, in fact, sited in Newtown St Boswells while the village of St Boswells was 2 miles to the south-east. There was an extensive goods yard to the north of the station on the up side with three sidings, one of which passed through a timber goods shed. The yard had a loading dock, end dock and a 3-ton crane. The yard was later extended to the east with further sidings serving the Southern Central Market, with extensive cattle pens. Initially there was no signal box but when the yard was enlarged two boxes were provided. 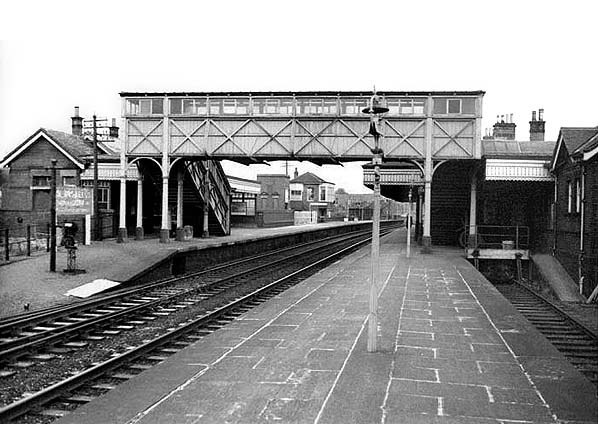 The north box was on the down side beyond the entrance to the yard, and a wooden South box was built adjacent to the footbridge on the down platform; this was later replaced with a large brick box towards the centre of the down platform, the upper floor overhanging the platform for improved visibility. This box controlled access to the shed yard. To the south of the station there was a stone-built two-road engine shed with a pitched roof backing onto the bay line. This had a stone water tower in one corner with a large cast iron water tank on top, and there was a stove in the room below to stop the water freezing in the winter and to provide hot water for foot warmers for first class passengers. 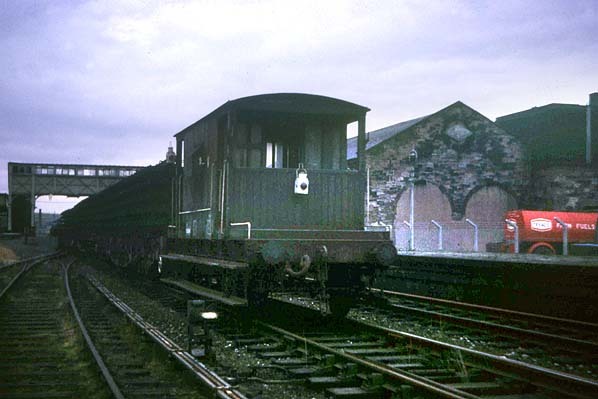 St Boswells and Riccarton were sub-sheds of Hawick (64G), 100 ft in length with room for six locomotives. There was also a coal yard and a turntable. A water column was provided in the shed yard with others at the end of both platforms. By the late 19th century a 3-storey, 6-bay railway granary with two hoists and a siding on its north side had been built at the south end of the shed yard. St Boswells shed closed in November 1959. 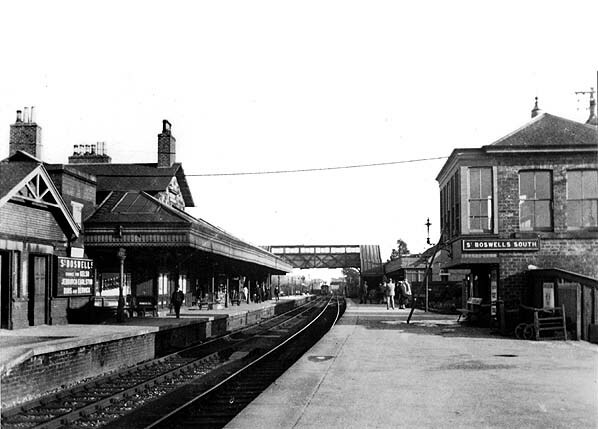 St Boswells station closed to passengers on 6 January 1969 but remained open for goods traffic until 28 April 1969. 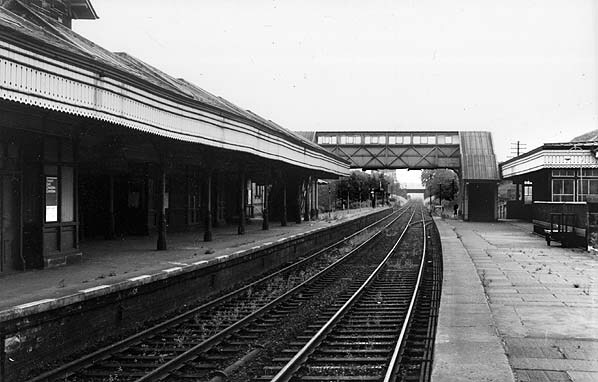 The track was lifted in 1971, and the station buildings were quickly demolished. 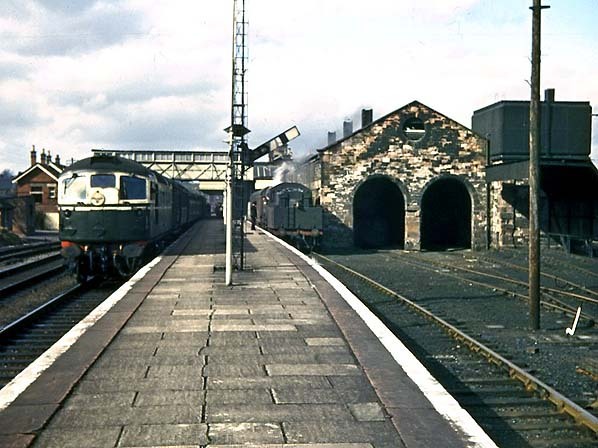 By 1977 only the platforms, goods shed and engine shed and granary remained. alteration to the course of the line was made between 1838 and March 1844 when the NBR produced a map showing its plans for route. The line was subsequently converted to standard gauge and doubled, reopening to Dalhousie in July 1847. The stations at Cairney, Sheriffhall and Lasswade Road were not reopened. church trains were provided to take worshippers to Newcastleton and Hawick on alternate Sundays.As the Borders Counties line was already open, Riccarton opened early, before all the railway facilities were completed. expresses; however the 'Waverley' express was typically eight coaches in length, and speeds on the Waverley Route were limited to 70 mph, and the many tight curves required more severe speed restrictions. On the climb from Newcastleton to Whitrope Summit the train would be down to 30 mph by Steele Road, with the locomotive being worked flat out. Other passenger services (usually three per day) were also worked by A3s, although Thompson B1 4-6-0s made regular appearances. There was also a daily Gresley A4 diagram between Edinburgh and Carlisle - an overnight fitted freight southbound, returning with the early morning parcels train. Thompson Pacifics appeared later on, just before the line was dieselised, in a drive for efficiency. In addition there were also several local passenger workings between Galashiels and Edinburgh (some via the Peebles loop, which opened in stages between Galashiels and Eskbank between 4 July 1855 and 1 October 1864) and between Hawick and Carlisle. These tended to be hauled by B1s. reached by roads of indifferent quality. Hawick, with a population approaching 20,000, was 43 miles from the Carlisle railhead, making it Britain’s most inaccessible town by rail. Despite its attractive scenery the area was generally bypassed by tourists, and its economy stagnated in the following decades as the traditional textile industries declined. As noted earlier, the Border towns suffered economic stagnation following the removal of their railway services. The devolved Scottish government, vested with authority to plan the nation’s transport system, was persuaded that reinstatement of the northern section of the Waverley Route could play a significant role in restoring the prosperity of the area. Consequently the Waverley Railway (Scotland) Act was passed by the Scottish Parliament by 114 votes to one; the Bill received Royal Assent in July 2006. It will reopen the line as far as Tweedbank, just south of the Burgh of Galashiels. £115 million has been allocated for the proposed route and services which will extend an existing Edinburgh suburban service from Newcraighall to Shawfair, Eskbank, Newtongrange, Gorebridge, Stow, Galashiels and Tweedbank. 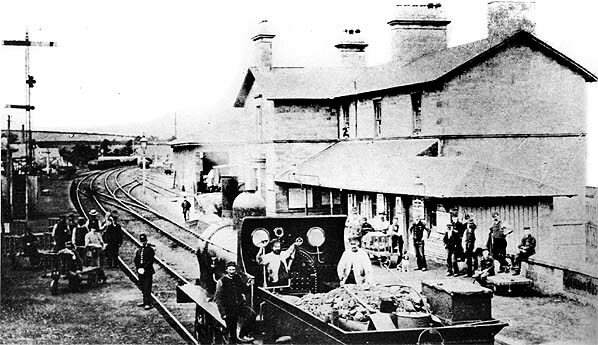 St Boswells station looking north c.1850s. St Boswells station looking north c. early 20th century. 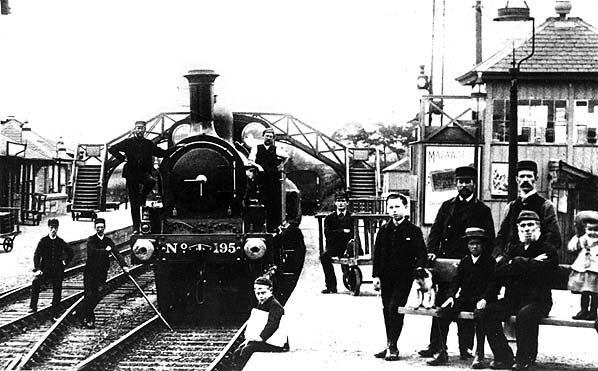 St Boswells station looking north c.1905. 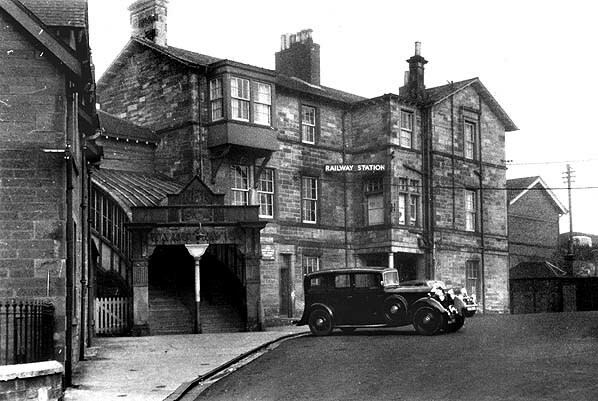 St Boswells station looking south in 1937. St Boswells station forecourt in September 1955. 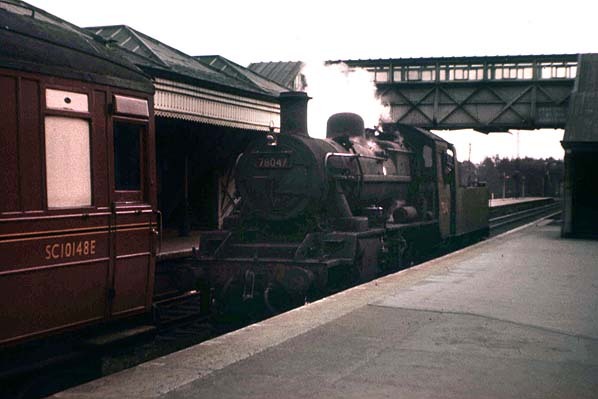 D5305 on Carlisle train at St Boswells in April 1962. The 4.00 pm train to Berwick stands in the bay platform. 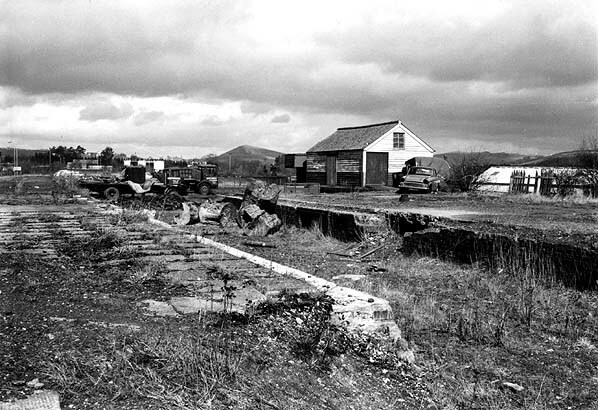 St Boswells engine shed, seen on the right, closed in November 1959. St Boswells station looking north in the mid 1960s. On the right is the bay platform used by trains on the Kelso and Berwick line. St Boswells station looking north in August 1969, 8 months after closure to passengers and 5 months after closure to goods traffic. The tail end of a northbound Sunday track-lifting train at St Boswells in the Spring of 1971. St Boswells station looking north in March 1978. The goods shed is seen in the background. 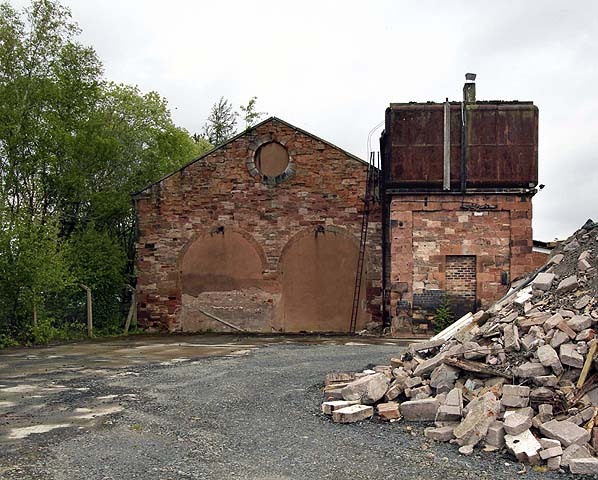 St Boswells engine shed in May 2011.